NetBet – €10 free bet on your first mobile bet! By placing your first bet from a mobile device, NetBet will reward you with a €10 free bet! Get your €10 free bet! Once this is done, your €10 free bet will be credited to your account within 24 hours of your qualifying bet being settled. This can then be used within 7 days on a match selection that has a single odd 1.60 or higher. Get your €10 free bet here! 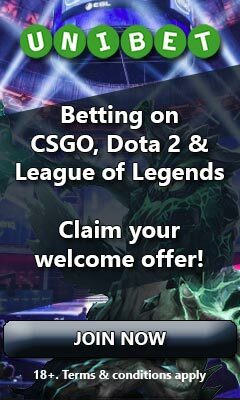 With a great coverage of matches from a broad selection of different games, you can be sure to find plenty of eSport odds offered at NetBet. They may not have the widest variety of entertaining markets, but for what they lack in this they make up for in casino games. It is in other words a great site for those who mainly bet on match winner, map winner and handicap, and love to switch up their betting with a huge selection of videoslots. To go along with all of this, you can expect a customer support that’s always available on live chat, e-mail and phone; a mobile app for iOS and Android, as well as an interactive cash out option. If you would like to know more, check out our full NetBet review.